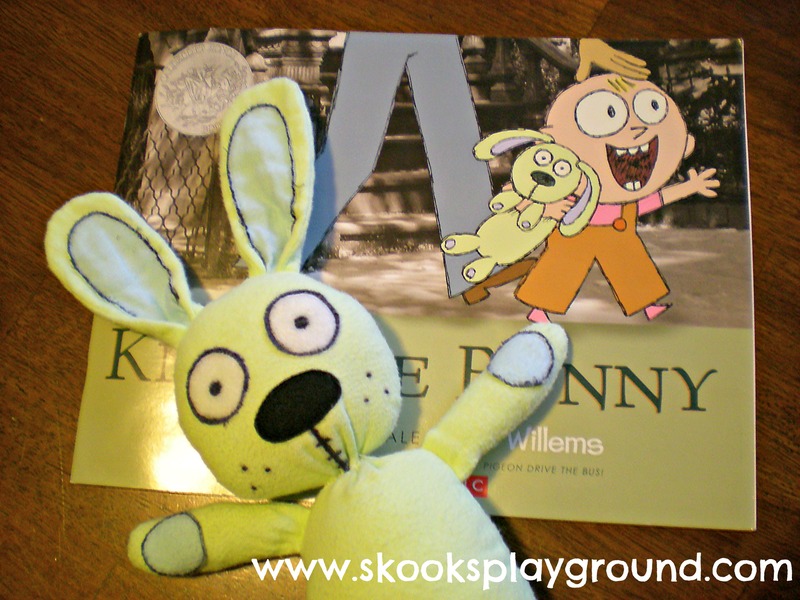 Have you heard of Mo Willems? I only ask because most of my family have no idea who he is, and expressed confusion when Little Miss told them she wanted to be Trixie from Knuffle Bunny for Halloween this year. Thrifted clothing + some fabric and paint I had on hand = less than $7 for the costume! No extreme closeups here . . . this costume was totally frankensteined together from several shirts I picked up from the thrift store and to reveal the actual stitching would be beyond embarrassing. 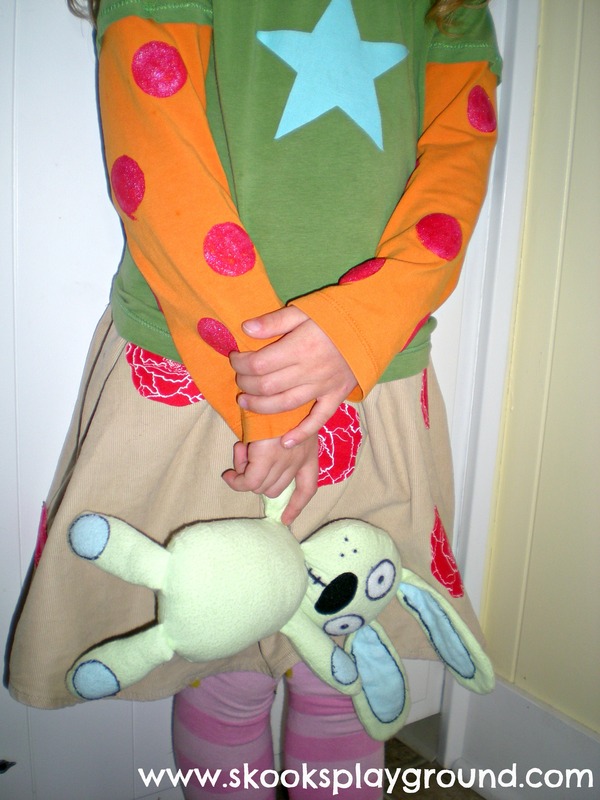 Yes - - the sewing quality is atrocious, but for the purpose of costuming a 5 year old it works well enough. The blue star on her shirt is made from a piece of scrap fabric and some Wonder Under. I free-handed the shape and didn't even bother to secure it with a zig zag. I know . . . REBEL. The polka dots on her sleeves were made using some fabric paint I had on hand (didn't realize it was sparkly until I opened it . . . oops) and a circle of kids' crafty foam glued onto an empty thread spool as a makeshift stamp. Hooray for using what you got! Had I known how much my kids would fight over this bunny I would have made two of them! The pink striped socks are DIY Babylegs that I made for LM when she was just a wee one. Just goes to show that you can get a lot of mileage from a simple sock-conversion project . . . she's now 5 and they still work for her! 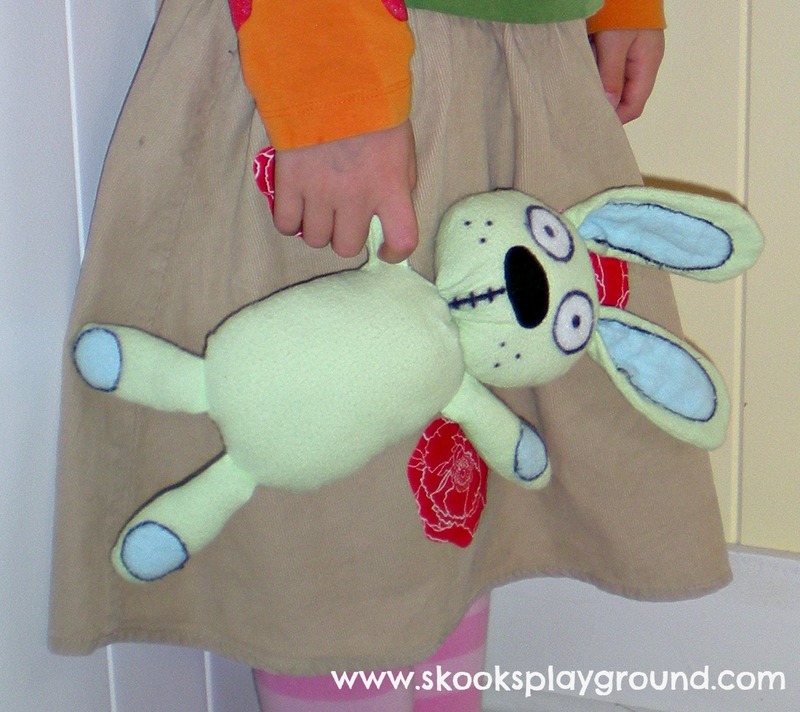 I had everything on hand that I needed to make this bunny except the green and blue fabric . . . cost me about $3 total to make! I searched around for quite awhile before I found a pattern to make the actual Knuffle Bunny. I am all for coming up with a pattern myself (I've made a lot of stuffed toys in the past and I'm sure I could figure it out), but when someone has already done the work . . . :) The tutorial I used is from Emilie at Plucky Momo and you can find it right here. It is a very good pattern (though I would recommend enlarging it a bit because stuffing the legs and arms was a bit tedious), and I only made a few modifications. I decided to use more marker around some of the features to keep it unified (like around the tail on the back and around the blue piece on the inside of the ears). I also sewed on the eyes and nose before I sewed it all together because I hate attaching stuff onto a toy after it has already been stuffed. I know there are reasons to wait until you finish that step, but given my experience I felt ok deviating a bit on this point. (Speaking of stuffing, I skipped the rice step too and just went for fiberfill for the whole thing.) Oh, and I didn't bother embroidering the facial features as I originally planned, but did it all in marker. If I was going to give this as a gift or had I had more time to work on it, I would have not used marker at all and would have embroidered black around all the features. As it stands though, the marker works fine and does give it a 'drawing come to life' feel which I actually do like. Anyone else whip together some homemade costumes this year? I would love to see them! 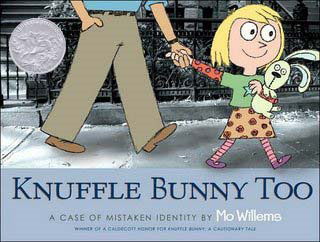 *I* know Mo Willems! And I know approx. 1 million kids AND librarians who love the Pigeon series. What a great costume! I think it's perfectly ok if your stitching isn't perfect, because after all it was just for Halloween, right?